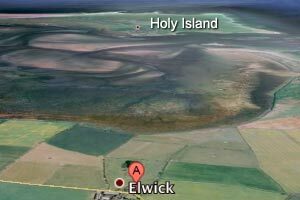 1) Travelling from the North: Approximately 13 miles from South of Berwick-upon-Tweed you will be on a long straight stretch of the A1 where Holy Island looks very close. You will see a sign saying ‘Buckton’ to the right then ‘Fenham-le- Moor’ to the left, these are just before our turning, also on the left & signed ‘Elwick & Easington Grange’. Travel over the railway crossing & continue approx. a mile, until you see a farm at the end of a long straight. This is Elwick. The cottages are on the left. If approaching from the Borders, by Kelso, Cornhill, follow the signs for Ford & Lowick, then Fenwick & when you join the A1 turn right & the above still applies from just before the long straight. 2) Travelling from the South: On the A1, approaching Belford, DO NOT TAKE the B1342 to Bamburgh/Belford Industrial Estate, continue Northwards, still on the A1. You will see a big sign saying ‘Belford’ to the left &‘Budle & Waren Mill’to the right, just before a cycle sign & a big ‘P’ sign, take that turning to the right (opposite CEMEX quarry) at the small traffic island. The sign says Waren Mill to the right & Belford to the left, there is no road number. After turning right off the A1continue over the railway crossing until the junction, where you turn left (signed Elwick). Go past the first farm, (Easington Grange) then the houses in the hollow, up the hill, around the left-hand bend & you will see some trees ahead. Follow the wall around the corner you will see a bungalow on the right side of the road with cut grass in front of it. Turn right into the cottages.